Lama Zopa Rinpoche gave this teaching at a refuge ceremony held at Kopan Monastery, Nepal, on April 1, 1995. Lama Zopa Rinpoche gave this teaching at a refuge ceremony held at Kopan Monastery, Nepal, on April 1, 1995. Lightly edited by Sandra Smith. 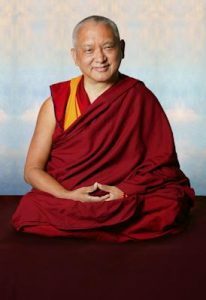 In this teaching, Rinpoche discusses the purpose of our life, how to make this precious human rebirth meaningful and how to actualize refuge in our own mind. The teaching also contains extensive advice on experiencing illness such as cancer for the benefit of others and how to establish a bodhicitta motivation in daily life. Rinpoche concludes with advice on the power of the objects of refuge. Portrait of Kyabje Lama Zopa Rinpoche taken in Portland, Oregon by John Berthold, 2006. First I would like to say thank you very much, I’m very happy to meet you. From the heart, I would like to thank you for coming to Nepal, to Kopan, from very far away. You have come to learn meditation, the teachings of the Buddha, which is learning about your own life, your own mind, or to put it another way, to learn what is false. What is the truth and what is false; to learn these two things. Anyone who is learning or attempting to learn something, it is either to benefit others, to obtain happiness for others or to benefit oneself. So the goal is either to benefit the world, to bring happiness and peace to others or if that is not the goal then, at least to benefit oneself, to obtain happiness for oneself. Now the obstacle, from where the obstacle arises to achieve happiness, either for oneself or for others, is by not knowing what is false and what is the truth. By not knowing this, then from this ignorance, not knowing this point, not having correct wisdom—knowing what is false and what is the truth. From ignorance the obstacle arises to obtain peace and happiness for oneself, and not only temporary, but ultimate happiness, everlasting happiness, which includes temporary happiness. In this way we can bring peace and happiness toward others. This can be as much wisdom—knowing what is truth and what is false—as much wisdom as we can achieve and put into practice, put it into action. This is the solution to obtaining peace and happiness for oneself and to cause this for other sentient beings. Therefore, we must study the teachings of the Buddha. Another way of presenting this, another way of understanding this, another way of looking at it, is to discover what is false. Believing that reality is true causes problems for ourselves and others, including the fundamental problems, the suffering of rebirth, the suffering of death, and all the problems in between, death and rebirth, old age, sickness and so forth. Then by learning what is the truth, what is the unmistaken path, what is the right method to achieve happiness, to find satisfaction in our life and to overcome the problems, the more we learn, the more we put into action, then we are able to overcome that and even to have control over the death. We are able to overcome even those heavy, unbearable problems of life, the suffering of rebirth and death and so forth. So we can overcome these. We can gradually overcome these, we can be free from these problems forever. We don’t have to experience this anymore. Not only are we able to achieve satisfaction in our day-to-day life, not only that, for ourselves alone to find some peace and happiness, some satisfaction in the heart, not just only that. Just to be happy, content, having peace in our own mind, not just that. One most important thing that we have to know—whether we are practicing meditation, whether we like to meditate or we don’t like to meditate—the most important thing to discover or to know, is the purpose of life, the purpose of why we are living, why it is so important to live the life, to live every day, why it is so important to survive, what is the purpose of living. Each day, each hour, each second, the purpose of our living. It is extremely important to have the correct understanding of that. That is the most important meditation, that understanding. Then living the life with that wisdom, with that thought to benefit others, with that thought to benefit other sentient beings. This is the best way to achieve happiness in the life, the best way to find peace and satisfaction in our own heart, by having the correct wisdom of the purpose of our life, the attitude to obtain benefit for other sentient beings. So now, the purpose of our life is not just to solve our own problems and to obtain happiness only for ourselves, not just that. This attitude, just living the life only with this attitude doesn’t fulfill the purpose of why we have this precious human body. You might have already studied this meditation subject, the graduated path to enlightenment, which comes in three divisions. The graduated path of the lower capable being talks a lot about how this human body that we have now is so precious, how it is so important, all the qualities that it has, all the advantages, all the benefits, what we can achieve with this precious human body. The benefits that we can achieve from this for our own happiness and especially for other sentient beings who are numberless, who want happiness and do not want suffering. With this precious human body, we can offer infinite benefit to the numberless other sentient beings. We can cause all the happiness—any temporary happiness, any ultimate happiness—we are able to give that to everyone, every other sentient being, who are equaling the limitless sky. Not only that, our mind also has buddha nature, the fully enlightened being’s nature, which is the clear light nature of the mind, which is pure, it doesn’t exist from its own side and is not oneness with mistakes. The nature of our mind is not oneness with the defilements. That is not the only reason. It is not only because of this—that in our mental continuum there is buddha nature, which gives all the hopes, all the possibilities that we can be liberated, that we can free from any problems, from any sufferings of samsara and never have to experience all those unimaginable sufferings of the hell beings or hungry ghosts, those beings’ sufferings, animal sufferings, human beings’ suffering, all those different beings. We can be liberated, so we never have to experience those sufferings forever once we are liberated from that. We can be liberated completely from the cause, the reason. We can be completely liberated from the whole entire cause of these sufferings, karma and the disturbing thoughts—the karma, the action and the disturbing thoughts, all the defilements. Because we have buddha nature in our mental continuum, this gives us all the hope, all the possibilities, that we can cease, we can be liberated from all the suffering and causes. This gives us hope, no matter how much we believe we have the heaviest problem, even if we are missing limbs or have TB, cancer or whatever; or that nobody is helping us, that nobody loves us; seeing, having these appearances in the life that nobody loves us or nothing is working in the life, everything got stuck, in business or whatever we try, that nothing is working, there are always constant problems or constant problems of health, disease coming or whatever. Whatever the heaviest problem we experience, because of our buddha nature, no matter how much we think that all these problems are so heavy, so unbearable, in reality they are all temporary, just as the sky is not oneness with the fog, with the fogginess. The sky itself is not oneness with the fog, therefore due to wind and so forth, due to causes and conditions, the fog goes away. The clear sky is obscured by heavy fog that blocks seeing the stars, the moon or the sun; due to cause and conditions it is collected there. Due to causes and conditions it happened there, it arose, but due to other causes and conditions the heavy fogginess that makes everything very gloomy or very dark goes away. During that foggy time it looks as if it is impossible for it to go away. It is very heavy, very dark, however in the next hour, due to other causes and conditions, then the sky becomes clear. We can see the sun or the moon; it becomes very clear. So what is happening is not forever because the nature of the sky is not oneness with this heavy fogginess, like that. It’s the same thing with our life experience, all our problems, whatever it is, even the suffering of death, AIDS and all these things, all these sufferings; so, you see, due to cause and conditions this happened, we experience these problems, we go through that, but because we have buddha nature, if we put together another cause and conditions then we can eliminate or we can cease all these unbearable, heavy problems of life. Our sufferings can be completely ceased and we can make it impossible to experience them again. Buddha nature is clear light, the nature of the mind is clear light. This is the basic reason, the fundamental reason which gives us all the possibilities, all the opportunities for good things, all the hopes for good things. On top of that, this time we have this precious human body, qualified with the eight freedoms and ten richnesses, so that we can achieve happiness in future lives. The reason why we bring up the happiness in future lives is because that happiness is long-term happiness. It is not a question of one year’s peace and happiness, it is not a question of one month or one day of peace and happiness. It is long-term happiness, the happiness of future lives. I am talking about long-run happiness. The happiness of this life, even if we did succeed in achieving this, is just a question of a few years at the longest, or a few months, a few weeks or some days, not sure. Anyway, it is very short; it’s a very short-time happiness. Any happiness of future lives, whatever we wish for, we can achieve with this precious human body. Even if we wish to receive the precious human body again, a human body or a deva body—those other beings who are living on the higher planets, who have much greater, much longer lives than human beings in this world and who have hundreds, thousands of times greater sense enjoyments than us human beings. Even if we wish to reincarnate in those realms after our death, to reincarnate in those deva realms, those worldly gods or devas, we can achieve that with this precious human body. Even if we wish to have perfect surroundings in our future life, so that all our wishes get fulfilled, so that we get a lot of support, so that people are harmonious with us, their mind is harmonious with our mind, they are happy with us and they support us; they don’t make us upset, they don’t become our enemy. If we wish to have perfect surroundings in the future, we can achieve that with this perfect human body, because we can create the cause for all these things. To receive the body of the happy migratory being in the next life, we can achieve any of those things, because with this precious human body we can create the cause by practicing morality. We can practice morality. It doesn’t mean we have to become a monk or nun; it means that whatever we can do—morality, whatever vows we can take—we can practice. We can also practice charity, we can dedicate the merits to receive the result. Then to receive perfect surrounding people in the next life, with this human body, we can create the cause for that by practicing patience in this life. That is a cause. Then, if we wish to receive a perfect human body, a human body that is qualified in the eight freedoms and ten richnesses in the next life, again to develop the mind in the path to enlightenment, again to continue to develop the mind in the path to liberation, to enlightenment, we can create the cause. With this perfect human body that we have now, we can create the cause for that. At the time of death, even if we wish to be born in the pure land of Buddha, where once we have reincarnated there we never have to reincarnate in samsara, where we don’t have the suffering of rebirth, sickness, such as AIDS and those things, all the problems. If we are reborn in those pure lands, we never have to reincarnate in samsara, to experience all the problems again. That’s it, that’s the end; we don’t have to reincarnate in samsara and experience all the problems again. If we wish to achieve that, to reincarnate in a pure land, and not only that, not only not having to reincarnate back in the suffering realm and experience all the problems again, not only that, in certain pure lands of Buddha, there we are able to complete the path and become enlightened, to free the numberless suffering sentient beings from all the obscurations, all the sufferings and lead them to full enlightenment. We can lead them to the peerless happiness, full enlightenment. If we wish to achieve this, we can do it with this perfect human body that we have received, that we have now. We can create the cause to reincarnate in this pure land of the Buddha, those certain deities or buddhas’ pure land. Once we reincarnate there, we never have to reincarnate again in samsara and experience the problems of life, all those unimaginable sufferings. Not only that, but we are able to develop the mind in the path, complete the path and become enlightened there. Then we are able to do perfect work for numberless other sentient beings without the slightest mistake. Naturally, spontaneously manifesting out of compassion, with perfect power and with the omniscient mind, with complete wisdom. Even in each second, liberating many sentient beings from the sufferings, leading them, guiding them to happiness, from happiness to happiness, to full enlightenment, which is the cessation of all the mistakes of the mind and completion of all the realizations. So we can create the cause for that. If we wish to achieve that, with this perfect human body we can create the cause, on the basis of practicing morality and the good heart, bodhicitta, the thought of benefiting other sentient beings. There are particular practices to create the cause to reincarnate in the pure land, meditations, things like that. Also, the other thing is, without reincarnating in the pure land, then again being reborn as a human being, taking a human rebirth, but a human rebirth which is much more qualified, having the eight ripening qualities. Having a human body which has the eight ripened, not ripening, qualities. If we are able to achieve this, then it becomes very powerful to have quick success actualizing the path to enlightenment. It’s very powerful, very powerful in order to have the realizations of the path to enlightenment, it’s very powerful to benefit. Then we are able to offer extensive benefit toward other sentient beings. As Lama Tsongkhapa mentioned in the lam-rim, in his teaching called Lines of Experience of the Graduated Path to Enlightenment. This was from his own experience, Lama Tsongkhapa’s own experience. In this lam-rim, Lama Tsongkhapa mentioned that, in order to have great success, to complete the realizations of the path to enlightenment, to have great success. Also to be able to offer extensive benefit toward others. Also if we wish, we can achieve the eight ripened qualities, such as a long life, and having control, having a powerful body and mind so that we can bear the hardships. Because the body and mind is very powerful we can overcome the problems, the obstacles to actualize the path, to meditate, to practice Dharma, We can overcome these easily, we can bear the hardships, not being small-minded, but with a brave heart. We can be like those many great yogis, like Milarepa. We can achieve enlightenment within a number of years, in this life, within a brief lifetime of degenerated time. This means a very short time. With a brave heart, not a small mind, not a weak mind, but a brave heart, and also physically not weak, but powerful, strong. Therefore we are able to succeed, to overcome the obstacles and succeed in actualizing the path, to complete the realizations of the path and so forth. So there are eight qualities, like that. These are necessary qualities to be able to extensively benefit to others. We are able to extensively benefit others, and also to easily develop our mind in the path to enlightenment. These are the qualities that we need for that. Also having a perfect body or precious body which has four Mahayana Dharma wheels. It means in the next life. We prepare in this life for the next rebirth, we prepare in this life, we make arrangements, we create the cause for the next life to be born in the place where there are Mahayana teachings existing. We are born in the right place, in a conducive environment, with parents, the family, those having the faith to follow the teachings, who have faith in these teachings. To be born where the Mahayana teachings exist, so where there are all these perfect conditions, again to meet Mahayana teachings; then to be able to continue to develop our mind in the path, which we haven’t developed in this life. So to achieve enlightenment for sentient beings. We can create the cause, we can achieve this with this perfect human body because we have created the cause. Then if we wish to achieve ultimate happiness, be free forever from the whole entire sufferings of samsara, which comes in the three: the suffering of pain, the suffering of change—those which are called pleasures but in reality they are suffering, which are labelled pleasures and we believe are pure happiness but in reality are only suffering. Those sufferings, those samsaric pleasures, are called the suffering of change. That is why those pleasures don’t last. The more we put effort, the pleasure decreases. Instead of continuing, increasing the pleasure, it doesn’t last, it decreases. Then pervasive, compounding suffering, which is the fundamental suffering of samsara. So you see, being free forever from the whole entire suffering and the cause, karma and delusions. If we wish to, we can achieve this, because with this precious human body we can actualize the path, we can create the cause. The fundamental path to achieve this, the higher training of morality, on the basis of refuge, having refuge in the heart, relying upon the fully enlightened being and the Dharma, the path, the method which liberates ourselves and others from the whole entire suffering and its causes. In reality that which does this, which liberates, which eliminates the whole entire suffering and causes is Dharma. In reality, it is our own mind. It’s our own healthy mind, it is our own positive mind, it’s our own wisdom, it’s our own compassion. The basic path is this, the basic Dharma that we are taking refuge in is our own mind. We are trying to achieve happiness by transforming our own mind from the disturbing thoughts into peaceful thoughts which produce satisfaction, peace and happiness, both temporary and ultimate. By relying upon our positive thoughts, trying to achieve happiness, that is Dharma, that is taking refuge in the Dharma, and that is the only way to achieve happiness. By relying upon that, with this Dharma wisdom, understanding, the happiness has to come from our own mind. It doesn’t come from outside, it has to come from our own mind. And how? From the positive mind, by relying upon our positive mind, our healthy mind, the thought which brings satisfaction, peace and happiness in our own mental continuum. By relying upon this and transforming our mind into this, then through this we achieve all the happiness up to enlightenment, the highest happiness, enlightenment. This includes day-to-day peace in our life, from there up to enlightenment. This comes from Dharma, which is our own mind. This is how we should realize what it means taking refuge in Dharma. It doesn’t mean surrendering to something that gives us no freedom, something which suffocates us or which doesn’t give freedom to us. It is not that. That is a misunderstanding of what taking refuge means. Thinking we surrender to something which doesn’t give us freedom. If the freedom that we want is for happiness, if it’s for peace and happiness, not suffering, then this way of taking refuge in Buddha, Dharma, Sangha only gives us the freedom to achieve what we want. We can achieve the peace and happiness in our heart, including liberation, enlightenment, all those things, including day-to-day satisfaction and peace of mind. But if what we want is suffering, not happiness, the opposite to peace, then it is different. We don’t achieve suffering from this. We don’t achieve suffering by taking refuge in Buddha, Dharma, Sangha. Taking refuge in our own Buddha, our own Dharma, our own Sangha, it is our own mind; it is that which is called result time Buddha, Dharma, Sangha. That is what we are looking for; what we are looking for is our own Buddha, Dharma, Sangha. That is the achievement. But in order for this to happen, in order to actualize our own Buddha, Dharma, Sangha, the result refuge, in order for this to happen, then this has to be created, this has to be actualized with the support of others, with others’ help. We need the help of other beings, who are separate from oneself, by depending on others’ support. To be completely cured of a disease, we must rely upon a doctor, medicine and nurse. To completely recover successfully from this severe disease that we have, then we must rely upon doctor, medicine, nurse. With this support, this help, then we can become completely healthy. We can be completely cured of the disease. To know all the treatment, to be able to diagnose and recognize all the sicknesses, to diagnose that and to know all the treatment to cure the disease, we have to study by relying upon a wise doctor. We have to rely upon somebody, to see somebody outside, like a wise doctor who knows everything. By relying upon that, by studying, then we can become the wise doctor who can help ourselves and others. It’s the same as that. Not only to achieve ultimate happiness, liberation from the whole entire suffering and causes for ourselves, not only for that, but to be able to become a perfect guide, to liberate the numberless other suffering beings from all the suffering and its causes, to lead them to peerless happiness, full enlightenment. To do that, we have to become a buddha by actualizing the Dharma, the refuge Dharma, all the realizations of the path. Then we have to become Sangha to be able to do perfect work, service for other sentient beings, to guide other sentient beings. We are practicing Dharma, practicing meditation and actualizing the path in order to become the result refuge, Buddha, the Sangha and to actualize the Dharma within our own mental continuum. This is the ultimate taking refuge. We are practicing meditation, practicing Dharma for this, so that we can become a perfect guide, able to do perfect work for all sentient beings. As I gave those examples, then we need others’ help and support for this to happen. we need to rely upon other beings, the buddhas, and their realizations, the Dharma that they have, the scriptural understanding and the realizations, their experiences that are unmistaken. We need to trust and rely upon that. We also need the help of the Sangha. We need the support of the Sangha, the inspiration from the Sangha for practicing the path, we need inspiration from them. For example, all these things, we have to have examples; we have to follow their example. Therefore there is a need to rely upon Buddha, Dharma, Sangha. Oour main goal is to become Buddha, Dharma, Sangha. It’s like becoming a professor, a doctor or professor, to be able to do that we have to learn from another professor; we have to get all the qualifications by relying upon somebody. Now I think that is on the basis of the three higher trainings, the higher training of morality, concentration, and wisdom. “Higher” means on the basis of refuge, by having refuge in the mind, then morality, practicing morality and concentration, wisdom. These are the fundamental paths to achieve everlasting happiness and liberation forever, to be free from the whole entire suffering, the cycle of death and rebirth, all the sufferings and causes. With this perfect body we can practice this and we can achieve liberation from samsara if we wish to. How do we achieve the highest goal, the full enlightenment? With this perfect human body we can practice bodhicitta and follow the bodhisattvas’ deeds, such as the six paramitas to ripen our own mind and there are four practices to draw others, which is to ripen the mind of others. However, with this perfect human body we can practice bodhicitta. In this human continent, this particular continent where we are, this is a suffering continent. There is the eastern continent, the human world, the northern continent, the western continent and the southern continent. There are different human worlds like this, and where we are now is the southern continent. In this southern continent, there are all kinds of lives, suffering and pleasure. We ourselves go through this, we see so much suffering and also, comfort, pleasures, all sorts of lives. However, because of this it is very easy to generate renunciation of samsara and because of this, it is very easy to generate compassion. For us, it is very easy, we who are born in this world, the southern continent, it is very easy to develop compassion toward others because it is easy to see the suffering of others. It is very easy to generate compassion, to develop compassion, therefore it is very easy to generate bodhicitta. If there is no bodhicitta realization, there is no enlightenment, then we cannot perfectly guide all other living beings from happiness to ultimate happiness, full enlightenment. We cannot perfectly guide others, we cannot do perfect service for others. The ultimate goal of our life is to free all sentient beings from all the sufferings and to lead them to happiness, especially full enlightenment, the peerless happiness. That is the ultimate goal of our life. To be able to achieve this goal, to be able to do this perfect service for others, we need to achieve the omniscient mind, knowing all the past, present and future, being able to see everything directly. Being able to see directly and being able to read the numberless other sentient beings’ minds, all the different characters—being able to see the different wishes that they have, their intelligence, the different levels of karma, their potential and the various methods that can fit to them. We have to know everything; we need to know the numberless methods to benefit other sentient beings and we need to have perfect power to reveal the various methods. Not only that, we need to have completed the mind training in compassion toward all living beings. We should have all these qualities. These are the basic qualities and there are also many other qualities. We should have all these qualities to be able to do perfect work, service for all sentient beings. Without bodhicitta realization all this is not possible. Without bodhicitta we cannot enter the Mahayana path and without entering the Mahayana path we cannot achieve all these qualities. In this particular human world where we are born now there is suffering, therefore we can easily generate very strong renunciation of samsara, renunciation of samsaric suffering. Then because of that we can generate very strong compassion easily and because of that, we are able to actualize bodhicitta very easily and strongly. Because of that very easy, very strong and very powerful bodhicitta, we are able to achieve enlightenment very quickly. The conclusion is that with this human body in this southern continent we can achieve enlightenment easily and quickly. In the six realms—the sura, asura and human realms and the hell, hungry ghost and animal realms—the only realm which has the opportunity to become enlightened within one life is this human realm. Not even in other human worlds, but only in this one, our human world, this southern continent. This is the only one. Human beings in the southern continent are the only ones with the opportunity to achieve enlightenment within one life. In one lifetime we can achieve enlightenment, therefore, we are extremely fortunate that we are born as human beings and we are born in this southern continent where we receive this human body. This human body that we have received in this southern continent is regarded as very precious because it has so many qualities and so much opportunity. 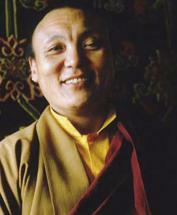 With this human body we can achieve liberation from samsara and we can achieve full enlightenment for sentient beings. These two are ultimate happiness. Not only in each day, but even in each hour, each minute and each second, with this perfect human body we can achieve any of these happinesses, any happiness of future lives, the temporary happiness, such as reincarnating in a pure land and so forth. Also, we can achieve any of those ultimate happinesses. We can create the cause with this perfect human body, even in each second in our everyday life. Therefore this precious human body, which is qualified with eight freedoms and ten richnesses, is extremely, highly meaningful. Even in each second it is very precious, even in each second in our everyday life. So like that. Maybe short break. As I mentioned before, if the attitude is just seeking happiness for oneself, to resolve our own problems; if we live our life with this attitude it doesn’t transcend, it doesn’t make our life anything special. Our life is nothing special, it is nothing higher than ants, insects or worms, or those very vicious animals, tigers or poisonous snakes. It is nothing special from them, nothing special from their attitude. Even those tiny insects and even those very vicious animals live their life with this attitude, only seeking happiness for themselves. They are constantly looking for protection, constantly looking for food and constantly only looking for happiness for themselves. That’s it. There is no thought of obtaining happiness for others, to benefit for others. Without bodhicitta we do nothing special from them. Externally we have the human body, which is something very precious, but internally we do nothing special. Just having that attitude doesn’t give meaning to this life. It doesn’t give the special purpose why we have taken this precious human body at this time and why we have not taken the body of a crocodile, a lobster, a frog, a spider, a scorpion, a jelly fish or an octopus. Anyway, there has to be a special purpose for having this precious human body. That attitude doesn’t fulfill the purpose of why we have taken this precious human body. In other words that attitude only becomes an obstacle to making this life, this precious human body, beneficial even for oneself, leave aside making it beneficial for other sentient beings. This attitude becomes an obstacle blocking even that this precious human body could be beneficial to achieve happiness for oneself. This attitude becomes a blockage for making this human body useful to achieve happiness even for oneself. Like that, as I mentioned before. The ultimate goal of our life or the real purpose of our life is to eliminate the sufferings of others, to obtain happiness for numberless other sentient beings. To free others who are numberless, to free each and every one of them from all the sufferings and to lead them especially to the peerless happiness, full enlightenment. That is the ultimate goal of our life. That is the purpose of our living. Think, “I am here to serve others, to cause happiness to others.” Live the life with this thought. Also feel the responsibility, the universal responsibility, that, “I have the responsibility to obtain happiness for all sentient beings. I am responsible for all sentient beings’ happiness.” Usually the reasoning is that if we have compassion toward other sentient beings, then they will not receive harm from us. They will receive peace and happiness from us and on top of that, by developing compassion, by having compassion, we benefit others. Not only do we stop giving harm, but also we benefit, we do something for others, we cause happiness to others. All the peace and happiness that numberless other sentient beings receive from us, that is dependent on us and that is in our hands. Whether we want to offer this happiness and peace to others or not, it is in our hands. Why? Because it’s up to our mind, what we do with our mind, what kind of attitude we have toward others, whether we have compassion, the thought to benefit others; whether we have this attitude toward others or not. Whether all the numberless other sentient beings receive happiness, what they receive from us, depends on our having compassion toward them. Therefore, it’s very logical that each of us clearly has universal responsibility. We have responsibility for their happiness, to obtain happiness for every living being. In twenty-four hours of our life, day and night, we should live the life with this thought, this purpose of life, the thought to benefit others, the thought to obtain happiness toward all sentient beings. This is the purpose of life, and the other thing is to feel the responsibility. When we get up in the morning, when we are waking up, getting up in the morning, if we get up with this thought, that means naturally the purpose of getting up is to serve others and to obtain happiness for other sentient beings. When we are dressing, if we are dressing with this thought, that naturally we are wearing our clothes in order to serve other sentient beings, in order to obtain happiness for other sentient beings, to benefit other sentient beings, then it naturally becomes that. The same thing when we eat breakfast, if we practice mindfulness, if we eat breakfast with this attitude, then naturally eating breakfast doesn’t become just for ourselves, for our own happiness. Having breakfast becomes an action to benefit others; even eating breakfast becomes an action benefiting other sentient beings. Naturally it is dedicated for others, so our actions are benefiting other sentient beings. When we are washing every morning, if we wash with this attitude, then naturally all the washing does not become for our own happiness; it doesn’t become ego. Even washing becomes a beneficial action toward other living beings. It becomes for others. Even washing, cleaning the body, becomes a beneficial action toward numberless other sentient beings. The same thing when we go from home to work, to our job, we should go with this thought, which is the purpose of life, the thought to benefit numberless other sentient beings, if possible. Not only to benefit the employer who employed us, not only to benefit those people who own the company; not only that we are causing happiness, not only to benefit the people who receive the goods, not only the thousands of people, or hundreds of thousands of people who receive the goods. Not only the thousands of people, or hundreds of thousands of people who receive the goods, the materials that are made in the company factory, including our own effort. Not only those people, the hundreds of thousands of people who receive those things and get comfort and pleasure from that. Not just this, but if we can think of the numberless other sentient beings, to benefit them. When we include these people—the employer, the owner of the company, and so many hundreds of people who receive the things that we are making, who we are sending letters to, or manufacturing, making things for—think that other people are receiving comfort, including them. When we go from home to the job, if we go with this thought, and also while we are working, eight hours or six or seven hours, however many hours we are doing the job, then also remember that. Even if the mind gets distracted again by ego, working for self, for our own happiness, if our motivation becomes ego, the selfish mind; even if it becomes that, then again try to transform it into the thought of benefiting other sentient beings, which is the purpose of life. Also, try to feel the responsibility, thinking that “I am responsible for all sentient beings’ happiness, therefore this is what I am doing here.” So, with a good heart, the thought of benefiting others. Same thing, when we have lunch and dinner, or when we go to bed, the same. When we go to bed, also do it with that thought of benefiting other sentient beings. Think, “In order to serve, to obtain happiness for all sentient beings, to do this service I need a long life, I need to be healthy, therefore I am going to sleep.” Same thing with food and all these things. Also, when we make parties, when we are doing things, making parties, giving food and drink to others, the same thing. Do it with the thought of bodhicitta, to benefit others, to obtain happiness for other sentient beings. In this way, it blocks the attachment, there is no motivation of attachment, which makes the action become non-virtue, the cause of suffering. The mind which makes the action the cause of suffering, non-virtue—that non-virtuous motivation is the attachment to this life, clinging to this life’s happiness—so that is stopped. Not only that, in this way all the activities that we do in our daily life—eating, walking, working, sitting, sleeping and so forth, all these activities—we don’t allow a nonvirtuous motivation to arise. We don’t allow the attitude for all these activities to become a nonvirtuous motivation, such as attachment clinging to this life, clinging to our own happiness, even just for this life. That is nonvirtue, that motivation is nonvirtue. Why is this nonvirtue? Because the nature of this thought and the effect that we get by letting this arise and the effect that we get back, the effect that we receive from that to your mental continuum is disturbing. The nature of that thought is disturbing. It’s not a peaceful thought, the nature of that is not a peaceful thought. The nature of that thought is pain. By letting it arise, it affects what we get, it affects our mental continuum. It disturbs us, it’s not peaceful. That is one reason why this thought is nonvirtue. The other reason is, because this is a nonvirtuous thought, the action motivated by this thought becomes nonvirtue. The effect of this action or the result of this action is only suffering. The result or the effect of this action is only suffering, therefore this motivation receives the label nonvirtue and the action motivated by this thought receives the label nonvirtue because the result, the conclusion, is only suffering. So, it’s like this. A plant which causes life danger by smelling or by eating it—if it makes us get sick and endangers our life, it receives the label poison. And something which cures disease by taking it, which has the effect, the result of curing the disease, then that receives the label medicine. It is just like that. It is exactly the same thing with our attitude and action. This is similar. They receive these labels according to the nature of that and the effect, the kind of result which comes from that. Therefore, try to live the life with this thought of benefiting others all the time. This is the purpose of our life, feeling responsibility for others. That does not allow our motivation of twenty-four hours’ life to become nonvirtue, thus we are protected in our everyday life, we are protected. We are saved, we are protected, because our mind is protected from these disturbing thoughts which are the cause of the sufferings. Therefore we are protected from the sufferings. In this way, by protecting the mind, we are protected from the sufferings of this life and the life after this; we are protected from the sufferings of samsara. We are always guided on the path to happiness by living the life with this special thought, the thought of benefiting other sentient beings, of obtaining happiness for other sentient beings. The other thing is ego. This thought of benefiting other sentient beings, the good heart, is completely against the ego. The motivation of our life is not stained by ego, the self-centered mind, therefore our motivation becomes very pure. Not only that, there are no nonvirtuous thoughts, no anger or attachment and so forth, not even ego, the self-cherishing thought. Our mind becomes very pure, very healthy, and this mind is the thought cherishing others, the thought of benefiting other sentient beings. This is a very content, very satisfied, very happy mind, and there is very deep peace, we are happy in our heart, it’s very enjoyable. With this thought our life becomes very enjoyable. With this thought even if we are in prison, we see meaning in our life. Even if we are living in prison, no matter wherever we are, no matter whether we are doing a retreat, doing meditation or in a place where we practice Dharma, meditation, or wherever we are. If we live the life with this thought, with this attitude, bodhicitta, the good heart, the thought of benefiting others, then wherever we are, whomever we are with, whether we are healthy or whether we are unhealthy; whether we have AIDS or whether we don’t have AIDS; whether we have cancer or whether we don’t have cancer; whether we are dying or whether we are living; whatever life experience is happening, whether there is material receiving or whether there is no material receiving; whether there is criticism or whether there is praise; whether there is bad reputation or good reputation; whatever is happening, if we live the life with this thought of bodhicitta, cherishing others, the thought of benefiting others, with this thought, wherever we are, whomever we are with, whatever life we experience, healthy, unhealthy, even dying, living or dying, it always has meaning with this thought. This thought gives meaning to our life. Somebody who is poor, by having these thoughts it makes their life very rich, it gives meaning to the life, they see there is meaning in the life. Even somebody who is very wealthy, somebody who is a millionaire, no matter how much the person has wealth, no matter how rich the person is, by having this thought it gives meaning having all this wealth, because everything is to benefit for others, all the wealth is to benefit others, with this thought. Therefore, it makes sense, it gives meaning to our whole entire life. Without this attitude, then however much wealth the person has, their whole life has no meaning. The wealth doesn’t fulfill the purpose of life, that alone doesn’t fulfill the purpose of life. In other words, without this bodhicitta, this good heart, the thought of benefiting other sentient beings, then how much wealth we have, with that alone, it becomes an empty life. It doesn’t give purpose, it doesn’t give meaning to the life. Our life becomes empty. Without this thought or without this attitude in life, this special attitude or thought of benefiting other sentient beings, then however much education we have—even if we have all this intellectual understanding, even of the Buddha’s teachings of sutra, tantra, the whole entire teachings; even if we have the understanding of the whole entire teaching—without this special attitude, the thought of benefiting other sentient beings, without this, then even with that much education, that alone doesn’t fulfill the purpose of our life. Even if we have that much intellectual understanding of Buddhadharma, the Buddha’s teachings, our life becomes empty. No question about others, how much power we have, how much reputation we have in this world, how much power we have achieved in this world, then no question, without compassion, without the thought of benefiting others, no matter how much of those other things we have, our life becomes empty. Without this special attitude, this special way of thinking, which is the purpose of life, the thought to benefit others, without this, even if we lived for thousands of years, if we had a long life and lived for thousands of years, it is nothing, it is empty. It becomes an empty life, even if we are able to live a healthy, long life for thousands of years. By having this special thought, this thought of benefiting other sentient beings, then whatever happens—whatever experience, whatever happiness or suffering, whatever circumstances we are experiencing, whatever is happening—everything becomes beneficial, everything becomes meaningful, beneficial for others. Even if we have cancer we can make that experience beneficial for all sentient beings. With this thought we can experience the cancer on behalf of all sentient beings who have cancer, who have the potential, who have the karma to experience cancer. With this thought we can experience the cancer on behalf of all sentient beings. This way of thinking about our experience of cancer becomes the most powerful healing and purification. It becomes the most powerful healing because in this way, by experiencing it for others, then it purifies the cause of the cancer which is the mind, our own mind, the disturbing thoughts, including the ego. The cause of the cancer is our own mind, those impure thoughts which are on the mind, the imprint of negative karma. By manifesting that, then the cancer happened, due to the imprint left by the past negative karma. With this bodhicitta, with this thought of benefiting other sentient beings, by living the life with this, then we experience cancer on behalf of all sentient beings. That purifies the cause of the cancer. It becomes the most powerful purification and it becomes the best healing. Experiencing the cancer itself becomes the healing. That itself, with this thought experiencing the cancer itself becomes healing. We use the cancer to heal the cancer. How? By purifying the cause of the cancer. That becomes the most powerful purification, purifying the cause of the cancer. It affects the mind. So, like this. Experiencing the cancer with this thought, with this bodhicitta mind, for the benefit of other sentient beings, experiencing cancer for the sake of all sentient beings, that itself accumulates infinite merit, because we experience the cancer for the sake of numberless other sentient beings who are experiencing cancer now and who have the potential, who have the karma, to experience cancer in the future. They are numberless. Because of that we are creating numberless merit, good karma, like skies of merit. Each second when we experience cancer on behalf of all sentient beings, we are accumulating merit like the limitless sky. We are collecting that many numberless merits. That means each time we are becoming closer to enlightenment. Each time we are becoming so much closer to enlightenment, the peerless happiness, the cessation of all the mistakes of the mind and the completion of all the realizations. We become closer to enlightenment each time. This itself becomes the quick path to achieve enlightenment, like tantra, the quick path to achieve the enlightenment. Why? Because it is the most powerful purification, it purifies the defilements and it is the most powerful, it becomes the method to accumulate skies of merit, good karma. The more we finish the work, accumulating merit, and the more of this work we get done, that much quicker we achieve enlightenment. This is achieved when we have completed the work accumulating merit; when we have finished the work accumulating merit—the merit of wisdom and the merit of method, or the other way of saying it is the merit of fortune. There are two types of merit to achieve enlightenment, to achieve the completely pure holy body of rupakaya and the completely pure holy mind of dharmakaya. Achieving these two depends on how quickly we achieve this, and how quickly we achieve this depends on whether we accumulate these two types of merit, how quickly we finish the work accumulating these two types of merit. With this thought of bodhicitta, we experience cancer, we do the meditations and experience the cancer on behalf of all sentient beings. So we collect limitless merit like the sky. Experiencing the cancer itself becomes the quickest path to achieve enlightenment. In other words, experiencing the cancer itself becomes the cause of happiness for all sentient beings. Because we are doing it with this thought, naturally it is dedicated for other sentient beings, we are experiencing this on behalf of numberless other sentient beings. How many hours, how many days, how many years, how many months, how many hours, minutes or seconds we are experiencing cancer with this thought, all this becomes the cause of happiness for numberless sentient beings. One reason is, after we have achieved enlightenment through this practice, through this bodhicitta practice, then we are able to do perfect work to guide sentient beings from happiness to happiness, to the highest enlightenment. That is how each second we are experiencing the cancer, how it becomes the cause of happiness, with this bodhicitta, experiencing the cancer in each second, it becomes the cause of all happiness for numberless other sentient beings. So, like that. This is how we transform the suffering into happiness. It becomes the best method to cease, to purify the cause of cancer, to not experience cancer, to have the happiness of not having cancer. This way, there is no emotional mind, no fear or worry, these emotional minds. There is only a content mind, a joyful mind, a happy mind, a satisfied mind, because with this bodhicitta we experience cancer for the sake of all sentient beings. By having cancer, it is giving meaning, having the cancer is giving meaning to our own life. We see it this way. Having these sicknesses is giving meaning to the life, giving a purpose to life. It gives a special meaning, a special purpose of life, to develop the mind in the path to enlightenment for the sake of other sentient beings. 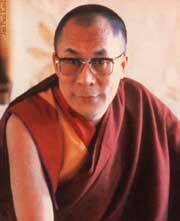 To conclude, the ultimate goal of our own life is to obtain happiness and benefit for all sentient beings. There are different levels. The first is causing happiness of this life toward others, causing this life’s comfort and happiness toward others. A more important service than this is causing the happiness of future lives, because the comfort of this life, even if we should attempt to achieve that as much as we can in our everyday life, even causing others the happiness of this life, it is a very short period of happiness, as I mentioned before. Therefore, causing others to have happiness in future lives, the long-term happiness, that is a more important service to offer others from our own side, because it’s long-term happiness. An even more important service than that is to cease, to end the sentient beings’ samsaric suffering, to bring that to an end, to cease all their suffering, including the cause, karma and delusion, and to bring them into ultimate liberation. This becomes a more important service to others, for us to offer or to cause, than the previous ones. The most important service is to bring sentient beings to the peerless happiness, full enlightenment, which is the cessation of all the mistakes of the mind and the completion of all the realizations. The cessation of all the mistakes of the mind, the disturbing thought obscurations, the gross mistakes of the mind. Then there are subtle obscurations which interfere with the sentient beings’ mind to be completely pure, to be omniscient mind, to become a fully knowing mind. To bring the sentient beings into the full enlightenment, which is the cessation of even the subtle mistakes of the mind, the defilements. To bring them to that state which is the completion of the happiness, the peerless happiness. There is nothing higher to achieve. To bring sentient beings into this peerless happiness, the full enlightenment, becomes the most important service. This is what is missing and this is what they really need to achieve. Now to be able to do all this service perfectly without any mistakes, then first the method of that, first we must achieve the state of omniscient mind, full enlightenment. For that we must actualize the path, the graduated path of the higher capable being. That depends on actualizing the preliminary, the graduated path of the middle capable being in general. And actualizing that depends on actualizing the preliminary, the graduated path of the lower capable being in general. I mentioned before the whole talk, that the purpose of life is to obtain happiness for all sentient beings, the best thing is to bring them to full enlightenment. To be able to do that is the purpose of life, the ultimate goal of our life. Now to be able to do that, we should be qualified, we should achieve full enlightenment. For that we need to actualize all these three levels of the path. To be able to do the job, to teach in the university, to become a doctor or a professor, to educate others, to teach others to become a doctor, all these things, then we ourselves have to become a doctor or professor. To do that we need to have all that education. First of all, we have to start with kindergarten, then primary school, then college, all those things. It’s the same thing here. In order to achieve full enlightenment, we have to actualize the graduated path of the higher capable being, the middle capable being and the lower capable being. All this is based on refuge, having refuge in the mind, relying upon Buddha, Dharma and Sangha. Whenever we see the benefit of learning Buddhadharma, the Buddha’s teaching, when we see the benefit of learning it and practicing it; from the time when we like to meditate on the path; from that time, wanting to meditate on the path, on the lam-rim, the path that, including Guru Shakyamuni Buddha and the numberless buddhas who actualized and liberated themselves from all the sufferings of samsara, all the delusions and karma, the cause of the sufferings, all the mistakes of the mind, and then were able to do perfect work, to enlighten numberless sentient beings, to liberate numberless sentient beings, even in each second. So, the path which is experienced by them and taught by them. From the time that we generated the wish to meditate, from that time we wanted to learn, we wanted to meditate, we wanted to experience, from that time, refuge is taken already in Dharma. In our heart, refuge is already taken in Dharma. From that time we have already taken refuge in Dharma. And that means somebody has to reveal the path, so naturally we have taken refuge in Buddha, the enlightened being who reveals the path. Since we are relying on that path, somebody has to reveal the path and it is revealed by Guru Shakyamuni Buddha, the fully enlightened being. So naturally the refuge is taken in Buddha. That needs support from the Sangha to actualize this. The actual refuge, Dharma, the path, which is our own mind, is like medicine. Therefore refuge in the Sangha is taken there. In this way, the refuge is already taken; in our heart the refuge is already taken. But the refuge now here is taking refuge with a ceremony. This makes it more definite, there is more certainty and this involves the refuge precepts, certain practices. Even if we cannot take those five lay precepts or any of those five, even if we cannot take these, within the refuge there are certain practices, certain negative karmas, certain disrespect, certain actions which are harmful to stop, which become an obstacle to developing our own mind to achieve the path, which become obstacles for the happiness of this life and the happiness of future lives, including enlightenment. So, to stop those things. Even the holy objects, Buddha, Dharma, Sangha, like the statues, stupas, scriptures and so forth; even those symbolic holy objects, to respect them and things like that. By respecting holy objects, it creates much good karma, much merit and that helps us to develop our mind in the path to enlightenment. Even if we are not taking any of the five lay precepts, within the refuge there are certain actions which become harmful, which become dangerous to develop the mind in the path to enlightenment. Therefore we try to stop those things and offer respect and things like that. This creates, this helps our own mind, this creates the cause and conditions to develop on the Mahayana path. Taking refuge in a ceremony, this is what is contained in this ceremony. Like that, it makes it more certain. I think maybe I will stop here. I think maybe refuge is going to be given by His Holiness the Dalai Lama. [Rinpoche laughs] Maybe I will stop here and those who are taking refuge, you are not leaving tomorrow? Then it can be done tomorrow. Maybe we can do it tomorrow morning, or we can do it now. At the time of death, just to not get reborn in the lower realms—the hell and hungry ghost, and animal realm. At the time of death, not to get reborn, for the consciousness to not migrate to those realms, to those suffering realms. Do you understand my words? Do you understand what I am saying? Do you understand my speech, what I’m saying now? What I’ve just said now, what I’ve just said before?, At the time of death, to not be reborn in the hell realm or in the hungry ghost or animal realm, just remembering Buddha is enough. Just by remembering Buddha we don’t get reborn, the consciousness cannot migrate to the lower realms. At the time of death, even remembering the mantra, like Guru Shakaymuni Buddha’s mantra, TADYATHA OM MUNÉ MUNÉ MAHAMUNAYÉ SOHA, or the Heart Sutra, the Essence of Wisdom, the short teaching which contains emptiness or some Dharma texts that we recite during our lifetime. If we remember that and if we die with that thought, we don’t get reborn in the lower realms. If we remember the mantra or even that Dharma text, even remembering the Dharma text. Even just remembering some Sangha, some ordained person whom we have faith in, whom we have devotion to. If we remember one ordained person, somebody whom we have faith in. When we are dying, if we die with that thought, we don’t get reborn in the lower realms. So just by taking refuge in one ordained person, it can protect us from reincarnating in the lower realms, from falling down into the lower realms. Now here, I often used to tell like this. I was trying to compare, for example, all the knowledge, the scientific technology, all that knowledge, of course the development of that is very good; as long as it is used to benefit others, it is beneficial. I am comparing normally. You see at the time of death, all that knowledge, having all that knowledge, at the time of death that knowledge will protect the mind, as if there is no connection to the death, no benefit at the time of death, to make it impossible to reincarnate in the lower realms. All that knowledge when we die to stop the mind migrating to the lower realms. At the time of death, it’s like there is nothing that we can use, at the time of death there is nothing to apply to protect our mind, to protect ourselves from reincarnating in the lower realms. Now, just remembering, not all Buddha, Dharma, Sangha, but remembering just one object of refuge, it protects definitely, one hundred percent, that we don’t get reborn in the lower realms. Just relying on even one object of refuge, then we don’t get reborn in the lower realms. Normally I compare the power of that much knowledge and the power of one object of refuge. We are able to protect ourselves from experiencing those unimaginable heaviest sufferings for an incredible time, for eons or for unimaginable time. So we are protected from that. There are many stories of how someone was saved just by remembering the text. That person was immediately liberated, even if they didn’t have refuge. At the time of death that person is already born in the hell realm or something, but the person remembers all of a sudden the text that they have been reciting, whatever it is, the Diamond Sutra or a short text that they have been reciting, they remember it. As soon as that person remembers that Dharma text, immediately it changes the realm, it immediately changes. Immediately the consciousness is transferred from that realm, it left that realm, and then was reincarnated in the deva or human realm. The consciousness left that hell realm. Immediately everything changed, the appearance changed from that unimaginable suffering due to the power of the object of refuge. There are many stories. Now here, why we have to take refuge in the Buddha, Dharma, Sangha, all three, is to not only be free from the lower realms, but from the whole entire samsara. To be free from all the sufferings: the suffering of pain, which includes heat and cold, hunger and thirst, all the sufferings that even the animals do not want to experience; and then the suffering of change, the samsaric temporary pleasure which in reality the feeling is only suffering but we label it pleasure and it appears as pleasure, which doesn’t last, which does not increase. To be free from the first suffering, the second suffering and the third suffering, the pervasive compounding suffering: these aggregates which are the contaminated seed of disturbing thoughts and create the future samsara again, which become the cause of future samsara, which continue to, which circle to the next life’s samsara. To be free from the third suffering, to be completely free from all these sufferings, to be liberated completely from all these three sufferings, then just taking refuge in Buddha alone is not enough. We should also take refuge in the Dharma. Even that alone is not enough; we also need to take refuge in the Sangha. So, all three. We are like very heavy, severely ill patients, so we need the doctor, the medicine, and the nurse. It’s the same here, taking refuge. To be completely free from the whole entire suffering and the cause, karma and delusions, it is necessary to take refuge in the Buddha, Dharma, Sangha, all three. Please make three prostrations to Buddha, the Buddha statue, by thinking that is an actual living buddha. Make three prostrations. Then after that, make three prostrations to the lama who gives refuge. The essence of the Buddha’s teachings is summarised in the three principal aspects of the path: renunciation, bodhicitta and the correct view. Since we now enjoy the favourable conditions of having obtained this precious human rebirth and meeting the teachings, even if we cannot generate the realisation of the three principal aspects of the path in our minds, at the very least, we should put effort into placing stable imprints of these teachings in our mental continua. Imprints can be placed in our mental continua through hearing, reflecting, meditating and familiarising ourselves with the teachings. How does this work? Imprints that come from hearing arise from the activity of listening to the teachings on the three principal aspects of the path. Without listening to these teachings, we would not receive any imprints through hearing. In the same way, this applies to reflection and meditation as well. The strength of those imprints of the teachings would vary in power in dependence on the manner in which we engage in the activities of listening, reflection and meditation. It is very arrogant of us to expect the teachings to come of their own accord into our minds, without our exerting any effort to familiarise ourselves with them. When we do not put in the effort from our own side to receive and familiarise ourselves with the teachings on the three principal aspects of the path, and to secure imprints of these teachings in our mindstreams, nothing will happen. We need to remember that we have obtained this human rebirth now and we have some knowledge of what is to be abandoned and cultivated. Capitalising on this opportunity, we must place strong imprints of the teachings in our minds and keeping this in mind, we must then engage in the act of listening to the teachings. Whether the teachings will benefit us or not does not depend on the teachings. It depends on how we apply them, whether we reflect on them and mix the teachings with our minds. We cannot expect the teachings, from their side, to change our minds if we do not do anything with them. There are some people who think, “What is the use of coming for teachings? The Dharma is not benefiting me.” This is not the fault of the teachings but rather reflects their failure to relate the teachings to their minds. 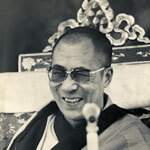 His Holiness the Dalai Lama often mentions that there is a noticeable difference between someone who accepts and practises the Dharma and someone who does not. Why? The person who practises the Dharma is a happier person who is more able to handle difficulties and problems when they arise, as compared to someone who has no faith or Dharma. Someone who accepts the teachings should have the ability to apply the teachings for a beneficial purpose and to use them to deal with problems and difficulties. I have explained this very good teaching. Your illness cannot be cured. This verse applies to us because we may have listened to many teachings but we still find it difficult to reflect on their meaning and are unable to put them into practice. That is why we do not see any improvement in ourselves. In fact, it sometimes seems that we are experiencing even more mental unhappiness and suffering than before. This is the fault of not having reflected properly on the meaning of the teachings that we have heard. We are just like the patient who carries around the bag of medicine without taking any. When we do not take the medicine, there is no way that we can recover from our sickness. We need to reflect on the meaning of the teachings that we have heard, in order to remove our problems and the suffering which have been with us, and which we have endured for a very long time. We need to understand that the Buddha is actually referring to us when he talks about the patient carrying the bag of medicine. We need to put down the bag of medicine, open it and start taking the medicine. It is not enough to just hear the teachings. We must start reflecting on them. We are now studying the text, Engaging in the Bodhisattva Deeds, which contains many wonderful pieces of advice and teachings. It may be difficult to put the teachings into practise immediately but, at the very least, we should reflect on the meaning of the words found in the text. We should not simply leave it at the level of listening or looking at the words. We have to try to reflect on the meaning of the words themselves. It is important to reflect on, as much as we can and to the best of our abilities, what we have learnt, and the meaning of whatever prayers we may be reciting. Why is it that we remain as we are and do not seem to change and improve? It boils down to the fact that we did not reflect on what we had heard. All of us have to try our very best to reflect on the meaning of the words of the teachings that we had heard and try to improve our own minds, because improving the state of our minds is an individual responsibility. 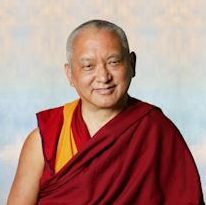 Lama Zopa Rinpoche’s holy wish for the centre is to produce good-hearted human beings, not simply students with some intellectual understanding of the teachings. That is his real wish. We should all try our very best to make this happen. It is not easy. It is difficult but we have to try our best. It is important to reflect daily on whatever you have heard and found beneficial from the teachings. Use whatever you have heard and apply it in your daily life. If you do not use the teachings in this way, you accomplish little by merely listening. This is advice from the teachings of Gungtang Rinpoche called Songs of Expressing Sadness. In one of these songs, he laments that although, in reality, it is the guru who shows us the path and protects us in this life and all our future lives, in practice, we make our own decisions without relying on him. We may think or even say that there is a need for us to rely on the instructions of our teachers and recognise that our guru is the embodiment of the three refuges. But, in our daily lives, we do not pay any heed to his advice or consider our teacher’s instructions to be important. Gungtang Rinpoche points out now we have attained this precious human rebirth of leisure and opportunities that is very difficult to achieve and which gives us the opportunity to accomplish so much. We know this and can even explain it to others. Yet when we examine our lives carefully, most of the time we are spending them doing meaningless things. When we reflect in this way and realise this, it is a cause for regret and something to be very sad about. Rinpoche’s advice is very good and beneficial especially if we are able to remember it in our daily lives. For example, when we can explain to others the benefits of this perfect human rebirth, but do not put it to good use ourselves, then we are in fact wasting our own precious human rebirth. In our daily lives we treasure our possessions and wealth and take great care to protect them from thieves and robbers. But we are not very careful with our life span, which is being exhausted and stolen every moment by the Lord of Death. We should be very sad about this also. We also pursue and hanker after teachings and instructions on hidden phenomena, which are not perceivable or manifest, such as emptiness, bodhicitta, tantra and so forth. But we do not pay any attention to those instructions that deal with subjects that are very obvious and accessible, such as death and impermanence. Again, this is a very sad situation. I am quoting some extracts from this set of advice as they are short and would be most beneficial if you can remember them in your daily life. But memorising the words alone is not enough when we do not pay any attention to or reflect on the meaning of those words. For example, if we sit in a puja, reciting the prayers without reflecting on their meaning, we are no better than parrots. This is not the correct way to do pujas. If we teach a parrot to recite OM MANI PADME HUM it can recite that 108 times quite easily. But that is about it. Without reflection on the meaning of the words of the teachings that we have received, we will be unable to correct any wrong or mistaken understanding on our part. The teachings should be investigated in depth. In order to study the scriptures of the Buddha, first, we must rely on the words. We must know the words of the text. But that alone is not sufficient. We must also reflect on the meaning of those words. That way of studying is not done here due to the lack of time. In the monasteries, we memorize all the root texts that we are studying and read the commentaries. But here, when the different verses are being explained, at the very least, we can check whether we are able to understand the meaning of each of those verses. The difference between a Buddhist who has studied and reflected on the teachings extensively (hereinafter referred to as ‘A’) and a Buddhist who has done neither (hereinafter referred to as ‘B’) can be seen in the quality of their meditation. ‘A’ will be able to meditate in a very extensive way while ‘B’ will find difficulties in sustaining his meditation. When reciting the refuge prayer, at the mere mention of “Sang gyä” (Buddha in Tibetan) ‘A’ will be able to reflect in the following way: “Who is the Buddha? He is in the entity of the four holy bodies2 and is someone who has eliminated all faults and perfected all his good qualities.” Being familiar with such reflections, ‘A’ is able to recall many different aspects of the refuge practice instantly and his faith in the Buddha increases. When ‘B’ recites, “Sang gyä” however, he may only recall the Buddha as the historical figure who achieved enlightenment under the bodhi tree over 2,500 years ago. It would be difficult for someone like ‘B’ to have any deep sense of faith. If this is so for a person like ‘B,’ then obviously there would be even less faith in someone who has not even heard of the historical Buddha. Understanding that the Dharma is the actual refuge and thinking that, “This is what protects me,” will definitely increase ‘A’s’ faith. He will then generate the faith of aspiration, which is the mind that aspires to actualise the Dharma. When ‘A’ recites, “Tshog kyi chhog nam la” (I go for refuge to the Supreme Assembly), he understands immediately that the Sangha Jewel refers here to all the arya beings, including the hearer superior beings, the solitary realiser superior beings and the bodhisattva superior beings. He knows the inconceivable qualities of these holy beings, and in particular, how the superior bodhisattvas practise at each level, actualising all the ten perfections and how they achieve the higher realisations on the path. Based on such understanding and knowledge, irreversible faith will arise in ‘A’s’ mind towards these arya beings and he will aspire to emulate their example. ‘A’ will never give up his faith in the Three Jewels regardless of whatever conditions he may encounter. When ‘B’ recites, “Tshog kyi chhog nam la,” he will only remember that the Sangha refers to the ordained community and he is reminded to be respectful towards them. With such limited understanding, it is very difficult to have real faith in the Sangha Jewel because it is difficult to see all ordained persons as pure and perfect and one may end up criticising them or questioning the benefit of ordination. The difference between ‘A’ and ‘B’ is very clear from simply examining the quality of their refuge practice. The Buddhist who has studied will have stable and irreversible faith while the Buddhist who does not study will give up his faith easily when faced with the smallest obstacle. We should put into practice, familiarise ourselves with and reflect upon whatever we have learnt. Even if we engage in extensive listening and reflection, it would not be beneficial without such mental familiarity. Using the earlier example of refuge, we can apply it to other topics and see the difference between engaging in practice with understanding and with little or no understanding. When we realise the benefits of studying and reflection, the aspiration to do so will arise naturally from our own side. When this happens, no matter what difficulties we encounter, we will try our best to come to class and listen to the teachings. This teaching by the Eighth Khamtrul Rinpoche was given at Tashi Jong Craft Community, Himachal Pradesh, India. Translated by Gerado Aboud; compiled and prepared by Brian Beresford. When beginning the preliminary practices (sngon gro) of Tibetan Buddhist meditation, it is extremely important to have complete faith in your teacher and in the teaching that he expounds. You should have no doubt that he is a Fully Awakened Being, or Buddha. Especially in regards to the Truth, or Dharma, you should not disparage the teachings of other traditions, holding yours to be superior. Simply consider that the teaching you follow is best suited to yourself. The various spiritual traditions are in accordance with the diverse dispositions and inclinations of the individuals. The different schools of Buddhism that developed in Tibet, Japan and elsewhere are all teachings of Buddha Shakyamuni. Within the Tibetan traditions there are four main schools—Nyingma, Kagyü, Sakya and Gelug. Do not consider the teachings of a particular school to be more advanced, for all traditions teach tantric meditations that can lead to ultimate realization within one lifetime. However, when commencing the preliminary practices it should be clear which system of teaching is more beneficial to your mind, according to your past karmic connections. By following the tradition most suited to you, you should have faith in the Fully Awakened Being and his Truth without any discrimination, because sectarianism is not only detrimental to your practice but is also an unwholesome action leading to miserable results. If you avoid this error, your practice will flourish and will proceed rapidly through all stages of the path. To arouse energy and enthusiasm in taking the teachings to heart (nyams. len) there are four contemplations that should precede and accompany all levels of meditation. These are the four topics that reverse the tendency of the mind (blo.ldog.rnam.bzhi) from being attracted to worldly occupations: (1) the freedoms and endowments1 of the precious human form, (2) death and impermanence, (3) actions, their cause and effect, and (4) the faults of cyclic existence, or samsara. If well contemplated these will ensure that your Dharma practice will proceed satisfactorily. Try to gain a thorough understanding of these topics as found in various texts and translations. However, merely to read and understand them intellectually is not sufficient. It is vital to keep them alive in your mind from now until the final attainment of the realization of the true nature of the mind and all phenomena. It is not enough merely to see a delicious banquet: you must eat and digest it before its pleasures are known! It is incorrect to assume that because these four topics have been contemplated initially they can later be disregarded. Why then are these four contemplations so essential? Firstly, they lead to sustained perseverance in the practice. Buddha Shakyamuni taught that cyclic existence is by nature suffering. In whichever realm of cyclic existence one takes birth, it is pervaded by suffering that arises because of unskillful actions committed out of ignorance, attachment or aversion to the objects that appear in the world. Through the principle of cause and effect of actions, or karma, skillful actions lead to happiness and unskillful actions lead to suffering. Diligence and enthusiasm for intensive meditation arise from the contemplation of suffering and its causes and the appreciation of the fragility of the precious human form: “precious” because it presents one with the most effective means for transforming sorrow. The Tibetan Kadampa masters of the past always emphasized that impermanence and the uncertainty of the time of death should always be remembered, as this alone will lead to buddhahood. Secondly, the contemplation on these four topics leads to an understanding of refuge in the Three Supreme Jewels. If you realize that the nature of cyclic existence is suffering you will seek to overcome it. As a Fully Awakened Being has transcended the play of worldly sorrows, he has the understanding to lead you beyond misery. The Truth, or Dharma, that he teaches is not separate from him and its validity is confirmed by those intent on virtue, or Sangha, who have realized high levels on the path to the cessation of suffering. In such a way these four contemplations lead to faith in the Three Supreme Jewels. Thus the essence of going for refuge is said to be fear and faith: fear of the pains of the round of existence and faith in the Three Jewels which give protection from them. This refuge is common to all vehicles of Buddhism, but in the Adamantine Vehicle (rdo.rje.theg.pa; Vajrayana) there are other reasons that can form the basis of refuge such as the Three Roots—of the lama, the yidam, and the dakinis. However, the fundamental refuge is the Three Supreme Jewels. In the tantric traditions it is stressed that one’s lama, or spiritual master, is the embodiment of the Three Supreme Jewels and is the basis for all other aspects of refuge. All powerful attainments (dngos.grub; siddhis) and realizations arise from devotion to him. This stress on the spiritual master may lead some people to think that the teaching he expounds is his own and not that of the Buddha. However, his practice is consummated because of the means that derive from Buddha and when this fulfillment takes place the Buddha becomes embodied in him. This is because when the spiritual master has realization of the ultimate truth his mind-form is the same as all previous Fully Awakened Beings, and thus there is no difference between the Buddha and him. The word Buddha, Sang-gyä (sangs.rgyas) in Tibetan, has two meanings. The first means a being who has “awakened” (sangs.ba) from the sleep of ignorance. This signifies all that is to be abandoned on the path, that is the abandonment of the two levels of obscurations: the obscuration of the afflictions (nyon.mongs.pa’i.sgrib.pa; klesa-varana) and the obscuration preventing the realization of all that is knowable (shes.bya’i.sgrib.pa; jneyavarana). The second meaning of the word is a being who has “spread” (rgyas.pa) his intellect to all that is known. This refers to his insight and completion of what is to be attained on the path, the primordial awareness (ye.shes; jnana) of a Fully Awakened Being. Because a Lama has realized both these qualities he is no different from all buddhas. Dharma, Chö (chos) in Tibetan, also generally has two meanings: written Dharma, as in texts and Dharma that is the realization. When a spiritual teacher has gained full realization, his thoughts arise from a mind that has fully awakened. Such a mind is known as the Dharma of realization. The disciples of the Buddhadharma are known as the Sangha, Gen-dun (dge. ‘dun) in Tibetan dun, or those Intent on Virtue. In the Lesser Vehicle (theg.dman; Hinayana) they are the monastic community and in the Great Vehicle (theg.chen; Mahayana) they are the awakening warriors, or bodhisattvas.2 However, this difference is not so important as usually the Sangha means all who are disciples of Buddha and his teachings. The spiritual master, in whom these Three Supreme Jewels are embodied, not only has the experience of what is to be attained and abandoned but also shows kindness in excess of even Buddha Shakyamuni. Since at present we are unable to perceive a universal Buddha such as Shakyamuni, the lama is here to teach from his own experience what must be practiced on the path to complete liberation from all confusion and dissatisfaction. In Tibet, Buddhist practitioners take refuge in the doctrine of the Great Vehicle until the fully awakened state of being is attained. However, the practitioner himself must also be an awakening warrior because the Great Vehicle doctrine must be in the minds of those who practice it and not just in the texts of past great masters. You should not seek refuge in the Great Vehicle simply because you dislike the suffering experienced in cyclic existence, which is the motivation of practitioners of the Lesser Vehicle. Nor should you follow the Great Vehicle in order to benefit your relatives and those close to you because, in fact, over beginningless lifetimes we have had similar relationships with all sentient beings. All living beings have been our parents at some time or other and it is for their sake that we endeavor to follow the Great Vehicle. Embracing all sentient beings with this motivation of an awakening warrior has two aspects: loving kindness and compassion. Just as you do not want to be afflicted with suffering and wish to be happy, so do all living beings. Loving kindness is the wish that all beings may achieve the happiness they desire, while compassion is the wish that they may be separated from suffering and situations that create pain. The numerous methods for developing these two feelings depend upon overcoming the attitude of cherishing oneself more than others, and on developing the attitude that all other beings are more important than oneself. You should never think only of your personal benefit; your thoughts should embrace the needs of all others. This is the basis of the awakening mind, or bodhicitta, that aspires to and ventures into the practices of awakening the primordial awareness for the sake of all other beings. In the path of an awakening warrior, the four preliminary contemplations, refuge, loving kindness and compassion, should always be maintained. At present our mind abides in cyclic existence and dwells in ignorance and confusion, yet it is this same mind that proceeds on the path and awakens to the ultimate realization. Just as a man changes his clothes yet does not change his name, the mind that achieves enlightenment is not some other mind from the one we now have. When the man removes all his clothes and stands naked, people still know him as the same man; just so, our mind, bare of the clothes of conflicting emotions, such as passion, aggression, jealousy and their instincts, is the same mind we have now. The main creator of all emotional afflictions is the ignorance that grasps at “I” and “mine”. From this fundamental defilement all other defilements arise. However, although you may intellectually understand that you do not have an ego it is not easy to eliminate the mental grasping at it. Because of the great strengths of prior tendencies and obscurations it is very difficult to purify this grasping, just as it is not possible to clean thoroughly at once an extremely dirty object. The method to eliminate the confusion of believing in an ego identity is to avoid grasping at the “self” in your activities. Although the best method for this is meditation on emptiness, most people are unable to meditate on this from the outset. At present you should have faith and then mentally examine which of the five main defilements of passion, aggression, arrogance, jealousy or ignorance is the heaviest. Like cutting weeds in a garden, first you have to cut off the conflicting emotions that are the strongest. If at this initial stage of mental development you let whatever negative emotions arise in the mind and follow them, actions leaving a propensity for future unsatisfactory results are created. So for a beginner the purpose of practice should be the subduing of mental afflictions. You must think of aggression, desire and so forth as your real enemies and destroy them. Furthermore, you must develop mindfulness so that you can be aware of hatred and other conflicting emotions whenever they arise within your mind. Because most people have poor mindfulness, defilements simply arise and develop, leading to conflict within and without. As your mindfulness increases the opportunity for conflicting emotions to develop decreases. This is how you should practice now. However, conflicting emotions will not always have to be approached in this way. The approach to them depends on the individual’s level of mental development. At first you have to acknowledge conflicting emotions as your enemy and eliminate them. Later, with increased mindfulness, you may simply watch them arise without trying to destroy them yet not falling under their influence. When you gain realization of emptiness afflicting emotions may be taken in and crystallized into the five primordial wisdoms. Aggression, for instance, may be transmuted into the mirror-like wisdom. When commencing the preliminary practices your mind can still be easily distracted so you must develop mindfulness and eliminate any mental wandering. If you attempt to deal with negative emotions without the force of concentration then there will be no certainty that your approach will be beneficial. Although there are many ways of dealing with mental afflictions, the main practices you must have throughout the whole path are mindfulness and lack of mental wandering. They both go together since without one the other will not arise, although generally lack of mental wandering is said to be the cause of mindfulness. These two practices will give you the ability to watch the mind and how it proceeds. For both to develop it is important to meditate on the suffering of the round of existence and impermanence. I personally feel that these two topics are especially effective for integrating the mind and propelling you into practice. Even if you meditate intensely on them for several weeks and then proceed onto other practices, the awareness of these fundamental preliminaries as well as the precious human form and cause and effect should always be maintained. The spiritual teacher who guides you through the practices speaks out of his own experience since he has achieved the states of being of which he is speaking. Traditionally a teacher would closely examine any disciple coming to him before consenting to give instructions. Only if he was satisfied with the disciple’s qualifications would he give teachings such as those on the extraordinary preliminaries (refuge and prostration, Vajrasattva purification and recitation of the hundred syllable mantra, offering the mandala of the whole universe, and union with the spiritual master) and on further meditations leading to the understanding of the nature of reality. However, at this present time it is difficult for the teacher to make such an intimate investigation. Therefore you should examine your own inclinations towards the various lineages of teachings. The faith you feel in your spiritual master must grow into the highest devotion, so it is advisable to spend more time investigating different traditions in order that you have no doubt once the commitment has been made. When Milarepa first went to a Nyingma Lama he had neither much devotion to him nor did he do much practice. Then when he went to Marpa, the holder of the Mahamudra teachings, he was so intent on receiving the teachings that even though he was always rejected, his devotion and enthusiasm never decreased. Eventually, because of his profound devotion to Marpa he was given the complete teachings and went on to achieve full realization. Similarly, you must investigate your own connection with a specific teacher and his teachings. If you have a strong connection with your teacher, then the instructions you receive will be of complete benefit to you. However, this should not lead you to think that your own teacher and teachings are superior to others. To make such a discrimination between the traditions, especially when beginning preliminary practices, will create many obstacles. The schools of Nyingma, Kagyü, Sakya and Gelug are of the Great Vehicle and all lineages come from Buddha. With the visualization of the assembly tree in the Drukpa Kagyü’s extraordinary preliminary practices prostrations are made to Dorje Chang (Vajradhara) and the specific lineage masters, but they are visualized as being surrounded by the masters from all Indian and Tibetan traditions. Thus the practices must be followed without any trace of sectarian bias. Think that the lineage you choose to follow is that which is best for you but do not think that it is actually superior to any other lineage. Once you have committed yourself to your teacher it is not advisable to forsake him for another. There is a risk then that apparent contradictions will arise sowing the seeds of doubt within you. This would mean that there would be no certainty of benefits accruing from your practice. The Buddha himself gave many teachings, all of which were meant to suit the different capacities and inclinations of the practitioners present at the time. In the same way the four schools of Tibetan Buddhism are suited to the varying dispositions of students. From beginningless time we have been under the power of confusion and ego-grasping. It is not a simple matter to purify oneself of these, but if you now have attained a precious human birth and have made contact with the Dharma and teachers it means that you must have had some connection from a previous life. Now you have the opportunity to free yourself from the net of emotional and psychological afflictions. However, it is not sufficient merely to collect many teachings and to read many books. You must actually put whatever you learn into practice and prepare yourself for death. Dharma instructions are only of value if practiced and applied to the activities of life itself. By taking the teachings to heart it gives them weight and significance. A short teaching given on the basics of Buddhism in New Delhi, India, 1960s. His Holiness gave this teaching in Delhi in the early 1960s. It was translated by Losang Chöpel and Glenn H. Mullin and first published in English in 1981 in Teachings at Tushita. This teaching was published in 2005 in the LYWA publication Teachings From Tibet. From the Buddhist point of view, the minds of ordinary people are weak and distorted because of the delusions and emotional afflictions they carry within. As a result, they are unable to see things as they actually exist; what they see is a vision that is twisted and defined by their own emotional neuroses and preconceptions. The purpose of Buddhism is to remove these distortions from the mind and thus facilitate valid perception. As long as we have not uprooted our delusions our perception remains tainted; when we eradicate them we enter a state of always seeing reality as it is. Then, because our mind abides in perfect wisdom and liberation, our body and speech automatically course in wholesome ways. This benefits not only us but also others, in both this life and those that follow. Therefore, Buddhism is said to be a path not simply of faith but also one of reason and knowledge. Tibetans are fortunate to have been born into a society where spiritual knowledge was both available and highly appreciated. However, having been born into it perhaps we sometimes took it for granted. The Buddha himself said, “Test my words as carefully as goldsmiths assay gold and only then accept them.” The Buddha taught people of all backgrounds and levels of intelligence for a long period of time. Consequently, each of his teachings must be weighed carefully for meaning and evaluated to determine whether it is literally true or only figuratively so. Many teachings were given in particular circumstances or to beings of limited understanding. Accepting any doctrine or aspect of a doctrine without first scrutinizing it analytically is like building a castle upon ice—one’s practice will be unstable and lack fundamental strength and depth. What does “practice Dharma” mean? Literally translated, Dharma means “that which holds”; it is the spiritual teaching that keeps or leads us out of suffering. Buddhism asserts that although at the moment our mind is overpowered by delusion and distortion, ultimately there is an aspect of mind that is by nature pure and unstained, and that by cultivating this purity and eliminating mental obscurations we are “held back” from suffering and unsatisfying experiences. Buddha taught the potential purity of mind as a fundamental tenet of his doctrine, and Dharmakirti, the Indian logician who appeared a millennium later, established its validity logically. When this seed of enlightenment has been sufficiently cultivated, we gain the experience of nirvana, freedom from all the shortcomings of samsara. As well as the concept of the seed of enlightenment, Dharmakirti validated logically the entire spectrum of Buddhist tenets, including the law of karma, the concept of rebirth, the possibility of liberation and omniscience, and the nature of the Three Jewels of Refuge: Buddha, Dharma and Sangha. As for the actual mode of practice, it’s a mistake to practice without a logical understanding of the doctrine. We should know well just what we are doing and why, especially those of us who are monks or nuns and have dedicated our entire lives to the practice of Dharma; we should be particularly careful to practice immaculately. The Sangha is very important to the stability of the doctrine; therefore, we should do our best to emulate the Buddha himself. Those considering ordination should first think well; there is no need to become a monk just to be an inferior monk. The Sangha has the responsibility of embodying the precepts. If you want to lead an ordinary life, leave monasticism to those of greater spiritual inclination and simply practice as a layperson as best you can. All world religions are similar in that they provide methods for cultivating wholesome aspects of mind and eliminating unwholesome ones. Buddhism is a particularly rich religion because, having developed in India when the country was at a high point spiritually and philosophically, it presents both a total range of spiritual ideas and a rational approach to the methods of spiritual development. This is particularly important in this modern era, when the rational mind is given such credence. Because of this aspect of rationality, Buddhism finds little difficulty in confronting the modern world. Indeed, many of the findings of modern science, such as those of nuclear physics, which are considered new discoveries, have long been discussed in ancient Buddhist scriptures. Because Buddha’s last advice to his disciples was that they should never accept anything on faith alone but only through rational investigation, the Buddhist world has always managed to keep the spirit of inquiry very much alive within its precincts. This is unlike many other religions, which lay claims on the truth and thus never allow any type of investigation that seems to threaten their limited descriptions of reality. Whether or not you are a Buddhist is determined by whether or not you have taken refuge in the Three Jewels—Buddha, Dharma and Sangha—purely, from the depths of your heart. Simply reciting Buddhist prayers, playing with a rosary or walking around temples does not make you a Buddhist. Even a monkey can be taught to do these things. Dharma is a matter of mind and spirit, not external activities. Therefore, to be a Buddhist, you must understand exactly what the Three Jewels of Refuge are and how they relate to your spiritual life. With respect to refuge in Buddha, we talk about the causal Buddha refuge—all the buddhas of the past, present and future, of whom the most relevant to us is Buddha Shakyamuni—and the resultant Buddha refuge—refuge in our own potentiality for enlightenment, the buddha that each of us will become. As for refuge in Dharma, there is the Dharma that was taught in the scriptures and that which is the spiritual realization of what was taught. Finally, we take refuge in Sangha, in both ordinary monks and nuns, who are symbols of the Sangha, and the arya Sangha—those beings who have gained meditational experience of the ultimate mode of truth. Therefore, we say that Buddha is the teacher, Dharma is the way and Sangha are the helpful spiritual companions. Of these three, the most important to us as individuals is the Dharma, for ultimately only we can help ourselves—nobody else can achieve our enlightenment for us or give it to us. Enlightenment comes only to the person who practices Dharma well, who takes the Dharma and applies it to the cultivation of his or her own mental continuum. Therefore, of the Three Jewels, Dharma is the ultimate refuge. By hearing, contemplating and meditating on Dharma our lives can become one with it and enlightenment an immediate possibility. All the great Kadampa masters of the past stressed that refuge must be practiced in the context of an intense awareness of the law of cause and effect; it requires observance of the law of karma as its support. Buddha said, “You are your own protector and your own enemy.” Buddha cannot protect us; only our own observance of the law of karma can. If we keep our refuge purely and live in accordance with karma, we become our own protector; if we don’t, if we live in a way contradictory to the spiritual path, we become our own worst enemy, harming ourselves in this and future lives. The mind of an ordinary person is undisciplined and uncontrolled. To be able to engage in higher Buddhist practices, such as the development of samadhi, insight into emptiness or the yogic methods of the various tantric systems, we must first cultivate a disciplined mind. On the basis of refuge and self-discipline we can easily develop ever-increasing experiences in higher Dharma practices but without the foundation of discipline our higher practices will yield no fruit. We all want to practice the highest techniques but first we have to ask ourselves if we have mastered the lower prerequisites, such as discipline. The aim of refuge is to transform an ordinary person into a buddha; when this has been accomplished the purpose of refuge has been fulfilled. The moment our mind becomes Buddha, our speech becomes Dharma and our body, Sangha. However, the attainment of this exalted state depends upon our own practice of Dharma. Leaving practice to others while hoping for spiritual benefits for ourselves is an impossible dream. In order to purify our mind of karmic and perception-related mistakes and cultivate the qualities of enlightenment within our stream of being, we ourselves must perform the practices and experience the spiritual states. The 108 volumes of the Buddha’s word that were translated into Tibetan have one essential theme: purify the mind and generate inner qualities. Nowhere does it say that somebody else can do this for us. Therefore, in a way, the buddhas are somewhat limited—they can liberate us only by means of inspiring us to practice their teachings. Many buddhas have come before but we are still here in samsara. This is not because those buddhas lacked compassion for us but because we were unable to practice their teachings. Individuals’ progress along the spiritual path depends upon the efforts of those individuals themselves. The process of self-cultivation has many levels. For beginners, however, the first necessity is to avoid the ten non-virtuous actions and observe their opposites, the ten virtuous actions. Three of these ten actions are physical: instead of killing we should value and cherish life; instead of stealing we should give freely of what we can to help others; and instead of taking others’ partners we should respect their feelings. Four actions concern speech: instead of lying we should speak the truth; instead of causing disharmony by slandering others we should encourage virtue by speaking about their good qualities; instead of speaking harshly and sharply our words should be soft, gentle and loving; and instead of conversing meaninglessly we should engage in meaningful activities. Finally, three of the ten actions concern mind: we should replace attachment with non-attachment; ill-will towards others with feelings of love and compassion; and incorrect beliefs with realistic attitudes. Every Buddhist should follow these ten fundamental disciplines. Not doing so while engaging in so-called higher tantric methods is simply fooling yourself. These ten are simple practices, observances that anybody can follow, yet they are the first step for anybody wanting to work towards the powerful yogas that bring enlightenment in one lifetime. When we take refuge and become a Buddhist we must honor the family of buddhas. Engaging in any of the ten non-virtues after having taken refuge is to disgrace Buddhism. Nobody is asking you to be a Buddhist; you’re a Buddhist because you’ve chosen to be. Therefore you should qualify yourself accordingly, and the minimal qualification is to avoid the ten non-virtues and cultivate their opposites. Granted, nobody is perfect, but if you want to call yourself a Buddhist, you have to exert some effort. When something causes attachment or anger to arise within you, the least you should do is make an effort not to be overcome by that distorted state of mind and instead maintain a free and loving attitude. The essence of Dharma is cultivation of the mind because all the positive and negative karmas of body and speech originate in and are given direction by the mind. If you do not cultivate an awareness of your mental processes and the ability to cut off negative streams of thought as they arise, twenty years of meditation in a remote cave will be of little value. Before looking for a cave you should look for good qualities in your mind and develop the ability to live in accordance with Dharma. Only then will sitting in a cave be better than a bear’s hibernation. Talking about doing tantric retreat while the ten foundations of Dharma are still beyond you is simply making yourself a laughing stock. As humans, we have the potential to attain enlightenment in a single lifetime. However, life is short and much of it has already passed by. We should ask ourselves how much spiritual progress we have made. Death can arrive at any moment and when it does we must leave behind everything except the mental imprints of our life’s deeds. If we have practiced and tried to live in accordance with Dharma during our life, or even gained realizations, that energy will be there within our mind. On the other hand, if we have spent our life in non-virtue, negative thoughts and memories of our samsaric ways will occupy our consciousness when it goes to the next life. Therefore, now, while we have the ability, we should practice Dharma intensively and purely. Dharma practice will bring peace and harmony to both ourselves and those around us, even in this life, and, should we not achieve enlightenment in this lifetime, it will give us a wish-fulfilling jewel that we can carry into future lives to help us continue along on the spiritual path. Ultimately, our future is in our own hands. Most people make fantastic plans for next week, next month and next year, but what counts most is to practice Dharma right now. If we do this, all our aims will be fulfilled. When we cultivate virtuous activities today, the laws of dependent arising ensure that a positive stream of change is set in motion. This is the preciousness of being human: we are able to affect dynamically our own future state of being by applying discriminating wisdom to all the actions of our body, speech and mind. To use and cultivate this discriminating wisdom is to extract the very essence of the human life.